Game on SoCal! During the football season, buy any 3 participating items at Albertsons, Vons or Pavilions stores to receive a unique code at checkout. Then, visit GameOnSoCal.com to enter the Game On! Ready, Set, Win! Sweepstakes for your chance to win each week. The Albertsons Game On! Ready, Set, Win! Sweepstakes is open to legal U.S. residents, residing in the following counties in southern California: Imperial, Inyo, Kern, Los Angeles, Mono, Orange, Riverside, San Bernardino, San Diego, San Luis Obispo, Santa Barbara or Ventura, 18 years of age and older at time of entry. The Sweepstakes begins 12:00 AM (midnight) PT on September 6, 2017 and ends 11:59 PM PT on January 9, 2018. Limit 15 Codes per person, per transaction. First Half Weekly Prizes: A prize package consisting of a 65-inch big screen TV, a Sponsor-selected gas BBQ grill, winner’s choice of either a $250 Albertsons or Vons/Pavilions Gift Card, and a L.A. Rams jersey. Four hundred fifty (450) Gift Card Prizes: Winner’s choice of either a $100 Albertsons or Vons/Pavilions Gift Card. Five (5) First Half Grand Prize Finalist Prizes: A pair of Sponsor-specified suite admission tickets to the December 10, 2017 L.A. Rams home game in Los Angeles, CA, an L.A. Rams jersey PLUS the opportunity to participate in the Grand Prize Finalist Event for the opportunity to win the First Half Grand Prize Airstream Basecamp trailer Prize or Runner-Up Prize. Nine (9) Second Half Weekly Prizes: A 2018 Hyundai Santa Fe Sport Ultimate sports utility vehicle, standard factory options included. Four hundred fifty (450) Gift Card Prizes: A $100 Sponsor-specified gasoline Gift Card. One (1) Second Half Grand Prize: A five (5) day/four (4) night trip for winner and one (1) travel companion to see the professional football championship game in Minneapolis, MN on 2/4/18 PLUS a pair of tickets to the Los Angeles Rams 2018 season home games in Los Angeles, CA. One (1) First Half Grand Prize Trailer will be awarded of an Airstream Basecamp trailer, standard factory options included. The remaining four (4) Finalists will each receive a Runner-Up Prize of Finalist’s choice of a $1,000 Albertsons or Vons/Pavilions Gift Card. For the names of winners, send a stamped, self-addressed envelope by 3/31/18, to: Game On! Ready, Set, Win! Sweepstakes Winners, c/o Don Jagoda Associates, Attn: AM, 100 Marcus Drive, Melville, NY 11747. The Sponsor of this Promotion is Albertsons Companies, LLC, 1421 Manhattan Ave, Fullerton, CA 92831. 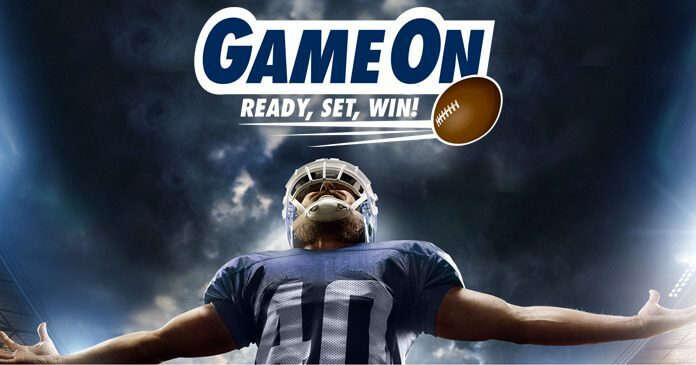 GameOnSoCal.com – Ready, Set, Win At Albersons!